GitLab Workflow is a logical sequence of possible actions to be taken during the entire lifecycle of the software development process. Idea: every new proposal starts with an idea. Issue: the most effective way to discuss an idea is creating an issue for it. Your team and your collaborators can help you to polish and improve it in the issue tracker. Plan: once the discussion comes to an agreement, it's time to code. But first, we need to prioritize and organize our workflow by assigning issues to milestones and issue board. Code: now we're ready to write our code, once we have everything organized. Commit: once we're happy with our draft, we can commit our code to a feature-branch with version control. GitLab flow was explained in detail in the previous article. Test: run our scripts using GitLab CI, to build and test our application. Review: once our script works and our tests and builds succeeds, we are ready to get our code reviewed and approved. Staging: now it's time to deploy our code to a staging environment to check if everything worked as we were expecting or if we still need adjustments. Production: when we have everything working as it should, it's time to deploy to our production environment! Feedback: now it's time to look back and check what stage of our work needs improvement. Again, the process itself is not new (or unique to GitLab for that matter) and can be achieved with other tools of choice. Let's discuss several of these stages and what they entail. There is also documentation available. The beginning stages of GitLab workflow are centered on an issue - a feature or a bug or some other kind of semantically separate piece of work. Management: an issue has a due date, an assigned person, due date, time spent and estimates, etc. to help track with issue resolving. Administrative: an issue is a part of a milestone, kanban board that allows us to track our software as it progresses from version to version. Development: an issue has a discussion and commits associated with it. Planning stage allows us to group issues by their priority, milestone, kanban board and have an overview for that. Development was discussed in the previous part, just follow any git flow you wish. After we developed our new feature and merged it into master - what happens next? Continuous Delivery is a software engineering approach in which teams produce software in short cycles, ensuring that the software can be reliably released at any time. It aims at building, testing, and releasing software faster and more frequently. The approach helps reduce the cost, time, and risk of delivering changes by allowing for more incremental updates to applications in production. A straightforward and repeatable deployment process is important for continuous delivery. In GitLab continuous delivery configuration is defined on a per-repository basis as a YAML config file. 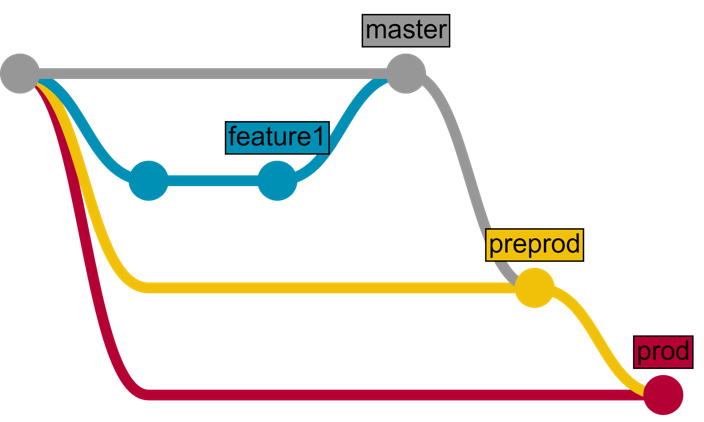 Continuous delivery configuration is a series of consecutive stages. Each stage has one or several scripts that are executed in parallel. What to do (run OS command, run a container)? What triggers it (commit to a specific branch)? Do we run it if previous stages failed? In what environment to run the script? What artifacts to save after executing the scripts (they are uploaded from the environment into GitLab for easier access)? Environment - is a configured server or container in which you can run your scripts. Runners execute scripts in specific environments. They are connected to your GitLab and execute scripts as required. Runner can be deployed on a server, a container or even your local machine. How does Continuous Delivery happen? New commit is pushed into the repository. GitLab checks Continuous Delivery configuration. Continuous Delivery configuration contains all possible scripts for all cases so they are filtered to a set of scripts that should be run for this specific commit (for example a commit to master branch triggers only actions related to a master branch). This set is called a pipeline. Pipeline is executed in a target environment, the results of the execution are saved and displayed in GitLab. Deploy stage moves built client into the web-server directory. Detected 1 errors during compilation in 0.010s. Compilation error caused our script to fail. GitLab supports all main stages of software development. Continuous delivery can help you to automate tasks of building, testing and deploying your software. Connect it to several environments with InterSystems products installed. Write a Continuous Delivery configuration. Let's discuss how our Continuous Delivery should work. And as an example, we'll develop one new feature using GitLab flow and deliver it using GitLab CD. Feature is developed in a feature branch. Feature branch is reviewed and merged into the master branch. The article is considered as InterSystems Data Platform Best Practice.